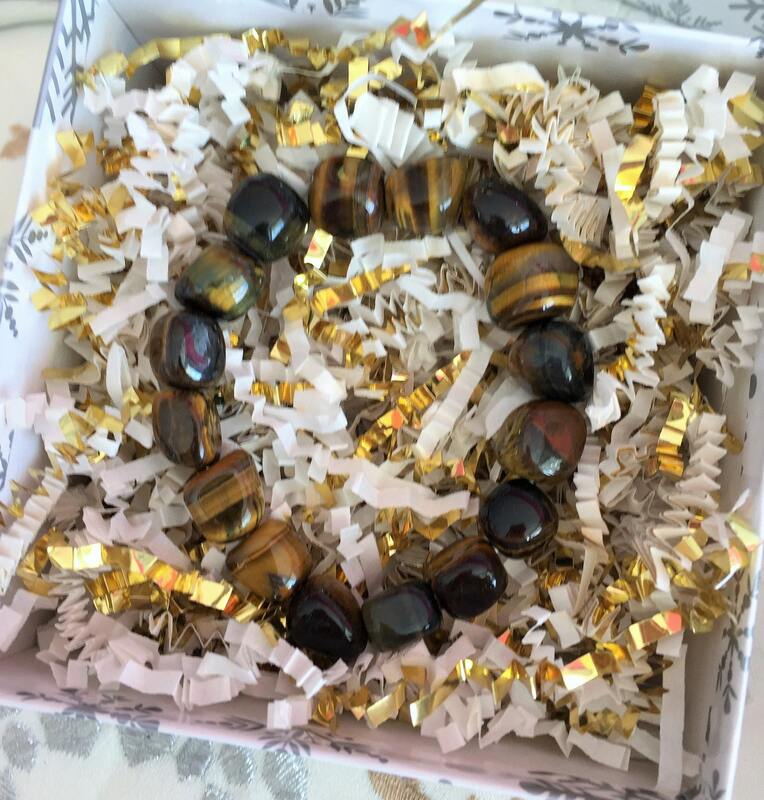 Tigers Eye stretch tumbled stone bracelets come with chunky stones that are polished smooth. Their shape is organic, rounded both in elongated and in chunky "boulder" shapes. Tiger’s Eye combines the energy of the Earth with the energy of the Sun, bringing grounding and optimistic energies. It helps you to see the positive in any situation, making a Tiger’s Eye bracelet the perfect accessory to wear every day. It is also known as a gemstone of protection, especially for travelers. Tiger’s Eye bracelets and jewelry bring good luck, prosperity and wealth to its wearer. In ancient times, this healing gemstone was used as a talisman against bad luck and curses and worn to attract abundance. A Golden Tiger’s Eye stone bracelet is also a powerful Solar Plexus chakra stone, which is extremely helpful in manifesting ideas and desires into reality, giving you the courage to make big changes in your life. It also helps your personal power and give you a little creative boost when you are feeling creatively blocked or drained. The golden yellow rays of this stone connects to the solar plexus while the brown connects to the root chakra. For many years I carried a piece of tumbled tiger’s eye in my pocket or had it somewhere on my body, which helped me to feel centered, confident and walking with both feet planted firmly on the ground. 1. Place your jewelry on the soil or branches of a healthy houseplant for 24 hours. 2. Place your jewelry outside under the sun or full moon for at least 4 hours. 3. Steadily hold your jewelry in the smoke of a burning Sage stick or Palo Santo stick. 4. Lay your jewelry on a piece of Selenite or Quartz Crystal for at least 6 hours. Want to see our collection of Gemstone Bracelets? Love it fits perfectly. Not too snug or loose. I love the smooth feel of the stones. Cute, fast shipping, thank you! Just received my bracelet. The tigers eye is so gorgeous I can’t even describe it. I’m so happy with my purchase!